Choose from the full range of lodgings available in Orvieto and the surrounding area. The best solution to suit your needs: Hotels, Farm Holidays, Historic Residences, Rent to Rooms, Apartments to Rent, Hostels, Religious Hostels, Camping and Country-houses. Consult our Typical Products section to find out where to get the area's best local produce and make the most of it in your kitchen at home. Got a few hours to spare and need some suggestions as to how to make the most of your time? Get the inside scoop on the full variety of cuisine available in Orvieto and the surrounding area, from the best local specialities to top international cuisine or just a simple pizza in the Restaurants, Pizzerie, and Pubs section. 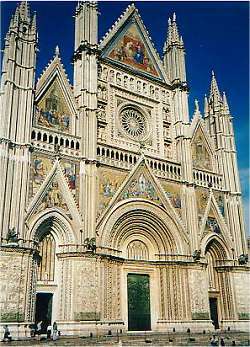 Discover the main shopping streets and squares in Orvieto. A virtual stroll past some of the city's smartest shop windows. Find shops, a brands, typical products, trendy bars, stores, wine-bar, disco, clubs and more with just a click of your mouse... .
LAKE CORBARA & THE WWF RESERVE AT ALVIANO – Rich in plant life and thick woods, the area around Lake Corbara is a fine example of how man’s intervention in nature can create a unique and natural habitat. Today this area, which has been artificially flooded into a lake by a dam placed along the river Tiber, is a major attraction for tourists. The panoramic road that runs around the lake and connects Orvieto with Todi offers stunning views. 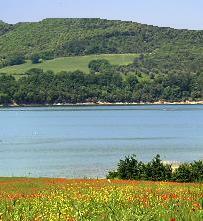 The Etrusco-Roman Wine Trail runs from Orvieto to Amelia past the lake and the WWF nature reserve of Alviano.